Debit and credit cards offer more than a way to access money without having to carry around cash or a bulky checkbook. Debit cards are like digitized versions of checkbooks; they are linked to your bank account (usually a checking account), and money is debited (withdrawn) from the account as soon as the transaction occurs. Credit cards are different; they offer a line of credit (i.e., a loan) that is interest-free if the monthly credit card bill is paid on time. Instead of being connected to a personal bank account, a credit card is connected to the bank or financial institution that issued the card. So when you use a credit card, the issuer pays the merchant and you go into debt to the card issuer. Most debit cards are free with a checking account at a bank or credit union. They can also be used to conveniently withdraw cash from ATMs. Credit cards have the advantage of rewards programs but such cards often require an annual fee to use. Financial responsibility is a big factor in credit card use; it is easy to overspend and then get buried in overwhelming credit card debt at a very high interest rates. This comparison provides a detailed overview of what debit and credit cards are, their types, associated fees, and pros and cons. Credit cards are lines of credit. When you use a credit card, the issuer puts money toward the transaction. This is a loan you are expected to pay back in full (usually within 30 days), unless you want to be charged interest. Any time you use a debit card to buy something, money is deducted from your account. With a debit card, you can really only spend the money you have available to you. Somewhat difficult, depending on one's credit score and other details. Easy, with basically no barrier to receiving a debit card. The credit limit set by the credit issuer. Limits increase or stay the same over time as a borrower's creditworthiness changes. However much is in the bank account connected to the card. If a credit card bill is not paid in full, interest is charged on outstanding balance. The interest rate is usually very high. No interest is charged because no money is borrowed. Credit cards in the U.S. are not very secure in and of themselves because many still use dated card security technology. However, consumers are not held liable for this poor security. A PIN makes them secure so long as no one steals the card number and PIN, and as long as you don't lose the card itself. If the card/info is stolen, debit cards are very insecure. Low. Rarely held liable for fraudulent activity. If you are, you are only held liable for a maximum of $50. High. If someone steals your card and makes purchases, that money is removed from your bank account. Investigating this damage takes time. The longer you wait to report the fraud, the more likely you will be held liable for your own losses. Responsible credit card usage and payment can improve one's credit rating. Credit cards typically report account activity to at least one of the three major credit bureaus on a monthly basis. Does not affect credit history. Low. Some credit card companies allow to overdraw amount over the maximum credit line with a fee. High "overdraft" fees. Possible to overdraw amount over the account limit. 1 What Are Debit Cards? 2 What Are Credit Cards? A debit card is always tied to a checking account, so they are also sometimes known as "checking cards." Any time you use a debit card to buy something, money is deducted from your account — usually on the same day, if not immediately. For example, if you have $1,000 in an account and spend $30 using a debit card, $30 is removed from the checking account, leaving behind $970. With a debit card, you can really only spend the money you have available to you. If you only have $970 left, spending any more than that may result in an overdraft charge. When you use a debit card for an in-person (not online) transaction, you must use your personal identification number, or PIN, to approve the transaction. When you use a debit card for a credit card-like transaction, you will normally have to sign a receipt (in the U.S.). However, signature requirements are being phased out in favor of PINs, so soon there will be no difference between the experience of using a debit card for a debit or credit transaction. It is easy to apply for a debit card. Any bank or credit union that you have a checking account with will issue you a debit card upon request. Unlike debit cards, credit cards are not connected to a checking account. Instead, they are tied to a financial institution, such as a bank or credit company, that is in the business of issuing revolving lines of credit to consumers. Whereas a debit card transaction is mainly between the buyer and seller, a credit card transaction specifically involves a third party: the institution who has loaned money to the buyer. For example, if you use your credit card to buy $30 of groceries, you are not directly paying the grocery store. Instead, the grocery store is paid $30 by the credit issuer. This is $30 that you now owe the credit card issuer. With a credit card, you are never limited by the amount of money you have in your checking account, which can be one of the major cons to debit cards for many consumers. Instead, you are limited by whatever the credit limit on the card is. If you are new to the world of credit, a credit card company may only issue you a card with a $1,000 credit limit. This means you only have $1,000 of revolving credit to use. Some card issuers increase credit limits over time for those who build up a good credit history by paying off their credit card each month (i.e., paying back their loan). It is relatively harder to get a credit card than it is to get a debit card, especially for those with no credit history or a poor credit history. When you apply for a credit card, the issuer evaluates your creditworthiness to determine how risky it is to loan you money. If the issuing company believes you are a poor credit risk, your application for a credit card will be rejected. Most people carry and use both credit and debit cards because both types of cards have their unique advantages. The vast majority of retailers in the U.S. accept both credit and debit cards, and customers pay the same price irrespective of the payment method they choose. But merchants pay a fee — called interchange fees — to payment processors like Visa and MasterCard for every credit or debit card transaction. This is usually flat fee, plus a percentage of the total transaction. The fees charged for a debit card are much lower than those charged for a credit card. In the U.S., merchant credit card processing fees usually total to about a 2% cut. So merchants prefer it when customers use debit cards. Some merchants, like Costco, only accept debit cards (with the exception of Costco-issued Amex credit cards). Other merchants, like Arco gas stations, offer small discounts to customers who pay via cash or debit cards. How much of that fraudulent activity are you liable for? For credit cards, it's only ever $50, at most. For debit cards, it depends on when you report the fraud. The U.S. lags behind other nations when it comes to credit card security. Debit cards, which make use of a PIN, are more secure cards in and of themselves. However, credit cards are much more secure for consumers in a practical sense when fraud occurs. If someone steals your debit card information, the thief has direct and immediate access to the funds available in the bank account connected to your card. As it takes banks time to investigate fraud, you will have little immediate recourse. 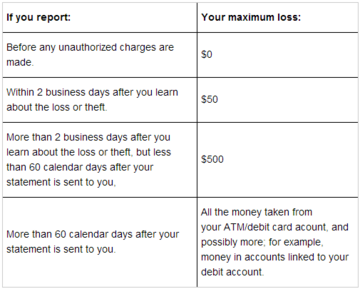 Worse, if you do not notice and report the fraud soon enough (within two days), you may be on the hook for $500 or more of your own loss. This can make paying bills that you would have otherwise had the money for difficult, if not impossible. In contrast, if your credit card information is stolen, the thief takes out money from your credit issuer. This is money that you will very rarely be held responsible for if you make a concerted effort to report suspicious account activity as soon as you are aware of it. Under federal consumer protection law, you can never be held liable for more than $50 of fraudulent activity on a credit card. With debit cards, you can usually ask your bank to offer overdraft protection or reject transactions when there are insufficient funds in the account. There is some risk of overdraft fees but you generally cannot spend a lot more money than you have if you use a debit card. On the other hand, credit card debt can become a nightmare very quickly if you fail to pay your bills on time. Most monthly credit card bills list two amounts — minimum payment due and monthly balance. If you only make the minimum payments that are due, interest starts to accrue on the remaining balance at staggeringly high rates of 12 to 24%. And since this interest is compounded, it is very easy to get mired in a lot of debt. Financial advisors are unanimous in recommending that consumers repay their credit card debt first, before other loans like student loans or home equity loans. It is important to build a good credit history for yourself over time. A good credit score ensures you pay lower interest on mortgages and car loans, and lower insurance premiums. Landlords and potential employers also run credit checks. Debit cards do not affect credit history at all. But credit cards can play an important role in building credit history. Owning a credit card and paying off credit card bills in full every month makes a positive impact on your credit history. Conversely, owning a credit card but falling behind on payments negatively impacts your credit score. Getting a credit card requires a lender to pull your credit. So if you have a security freeze on your credit, you will have to temporarily lift it to apply. Most banks also pull credit when you open a new checking or savings account but some do not so you may be able to get a debit card without lifting the security freeze. For years credit card issuers have been enticing customers to sign up by offering rewards programs for using the card. The more you spend, the more money card issuers make in transaction fees and, possibly, in late payments and interest if you fall behind in repayment. The most common credit card rewards are airline miles, "points" that can be redeemed for cash or discounts at certain retailers, and cash back. A majority of the credit cards that offer rewards also require an annual fee for the use of the card. One exception is the Capital One Quicksilver card, which offers 1.5% cash back on all purchases and has no annual fee. Banks have also started offering some rewards for the use of debit cards but these are not as strong as credit card reward programs because banks get lower fees per transaction on debit card use. Examples of debit card rewards include fee waiver on checking accounts if the debit card is used three times in a month, and revolving discounts at certain merchant locations. Few debit cards charge monthly or annual fees, nor do they charge interest. Some credit cards charge an annual fee (which may or may not be worth it, depending on the card's rewards), and all credit cards charge late fees and interest on debts that are not repaid on time. See also Annual Percentage Rate vs Interest Rate. The main fee consumers have to be aware of when it comes to debit cards is the overdraft fee or charge, which may be as steep as $30 or more per overdrawn transaction. An account becomes overdrawn when you make a charge that exceeds your available balance. For example, if you have $100 in your account, but spend $120, you have exceeded your account balance by $20 and may be charged an overdraft fee by the bank. If you have not opted in to an overdraft coverage program, your card will simply be declined. Most banks offer overdraft protection and coverage services for a price. A few banks, such as Ally, support free overdraft protection by linking up multiple accounts so an overdrawn account will have access to "backup" funds. Not all fees are bad, perhaps. For example, debit and credit cards often charge small fees for transactions carried out overseas, but these fees or rates are often much lower than currency conversion rates you can get at a traveler's exchange using physical money. (And some credit cards, in particular, have no foreign transaction fees at all.) Of the two types of cards, debit cards are more likely not to work overseas, so confirming their functionality before traveling with them is a must. In recent years, a personal finance subculture has risen out of credit card rewards — specifically out of how to take the most extreme advantage of card signup bonuses and card rewards programs. This process, which usually involves signing up for lots of different credit cards (and sometimes later closing them), is usually known as "churning." While not exactly widely known, churning has become popular enough over time to have an active subreddit community and garner the attention of financial advice sites and the credit card companies themselves. Some who are especially careful may benefit from their efforts, but long-term returns may not go as planned, and churning — particularly any and all opening and closing of accounts — can negatively affect your credit score. Churning can be an especially bad idea if you are looking to take out a mortgage any time soon. Because a debit card is connected to a bank account that it withdraws funds from, as needed, there are no further payment processes to consider. Credit cards, however, are loans that must either be repaid in full by a certain date or have a minimum amount, as set by the card company, paid onto them at the end of each billing cycle (with the knowledge that interest will be charged on any balance carried over into the next month — the loan left unpaid). Most credit cards operate on a 30-day billing cycle. In the past, some credit cards operated on different billing cycles that made due dates fall on different days of the month. Following the passage of the Credit CARD Act of 2009, credit card bill due dates must fall on the same day each month, and no late fees can be charged for payments that are "missed" due to the effects of holidays or weekends on the banking system. 1. PIN-only cards: PIN-only debit cards are linked to your bank account and can be used for cash transactions and fund transfer, buy from retailers and pay bills online or by phone. The card holder is required to enter a secure PIN for every transaction to establish identity and maintain security. 2. Dual-use cards: Dual-use debit cards are both signature- and PIN-enabled, and tied directly to your bank account. You can verify your identity either by signing or entering your PIN. 3. EBT cards: Electronic Benefits Transfer (EBT) cards debit cards provided by a state or federal government agency to users who qualify for food stamps, cash payments, or other benefits. EBT cards can be used to make purchases at participating retailers or to withdraw cash from an ATM, depending on the type of program. 4. Prepaid cards: Prepaid cards are not linked to a specific account, but provide access to funds deposited directly on the card by you or a third party. In effect, they work as a store-credit or gift card. Except prepaid cards, all other types of debit cards are linked to a bank account, typically a checking account but some savings accounts also offer linked "convenience" cards. 1. The Standard Credit Card: These are general purpose credit cards with revolving balance (i.e. credit is used up when purchases are made, and is open again once the bill is paid). Standards cards are usually starter credit cards, usually for applicants with little or no credit history who meet the minimum required criteria. 2. Reward Credit Cards: These cards offer several rewards programs in the form of cash, points or discounts, and are intended to influence your spending. Reward cards usually come with an associated annual fee and a lot of fine print; the key is to make sure the rewards earned exceed the annual fee. 3. Secured Credit Cards: Also known as pay-as-you-go cards, their primary purpose is to give people with bad credit history a chance to reestablish credit. The user first deposits a "secure" amount (say $300-$3000) —typically into a savings account — that makes for the credit line. The credit limit is usually a percentage (50%-100%) of this amount. These cards come with an annual fee and a high APR. 4. Charge Cards: Charge cards do not have a preset spending limit and balances must be paid in full at the end of each month. I wish that shopping sites could provide EMI on debit cards.